Tony Denikos, (pronounced " Dee-nye-kes"), formerly known as Tony De, was born in the early sixties in Washington DC. Tony's pre teen years were spent listening to the Beatles , Harry Belafonte, Ray Charles and Louis Jordan. He began performing at the age of nine in vocal groups at festivals throughout Maryland. Tony was a natural -he was drawn to performing from the start. By the age of fifteen he was playing bass and singing lead vocals at local gigs. He began writing songs on his acoustic guitar and playing them for audiences at schools and parties. Folks responded immediately to his honest style of writing. At the age of seventeen, Tony headed south and began performing his songs in the Virginia tidewater area. 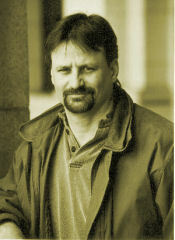 Tony began to develop a writing style that mixed rock, folk , country and blues. Influenced by artist like Lowell George, Bruce Springsteen, John Fogerty and John Prine, Tony found a musical voice that is at once familiar and refreshingly original. In 1997 Tony Released his debut CD " Naked and Smiling" which is a collection of songs written between 1979 and 1996. These tunes established Tony as one of the regions finest songwriters. Tony released his second CD entitled " Time Tells Tales" in the fall of 2003. This CD is a creative statement. From Bluesy overtures reminiscent of the artist of the late nineteen-forties to songs with lively, eclectic rhythms and messages that lift the spirit, as well as powerfully written ballads that stops one in their tracks and makes one feel, reconsider and dream. Today you can catch Tony performing his songs at venues throughout the Washington / Baltimore region with a band of incredible musicians presenting the listening world to a writing style uniquely his own.